First of all we must say that we have never been to a Korean restaurant before so we have nothing to compare with. The food was however made with a lot of ambition even if it did not entirely please us. Also we had the set lunch menu that might be something totally different to the more expensive alternatives. For starter we had Korean Ravioli that was beautifully made with beef filling, but we had expected more filling with more tastes and less pastry. My main course was a Korean specialty – Bibimbap - that was nice, especially with some hot sauce. My wife had pork ribs grilled with a sauce that made them black, which we were explained was not because it was burned – it was the caramelized barbecue-sauce. My desert was classic caramelized bananas, which was good, but my wife’s coffee was very weak and not warm. They however did not charge for the coffee as my wife did not really like her ribs. My wife had a very good white wine from Chateau Grand Moulin. They poured her a glass and left the bottle so she could drink as much as she wanted. They charged for what she had consumed – a very nice way of serving wine. Myself I had a Korean beer Cass, which was very nice with the food. The service was nice and the decoration of the restaurant brand new in, what I think is Korean style. You could call it Asian no-nonsense design. The rest-rooms were very proper, modern and stylish. I was especially impressed by the black toilette-paper. This restaurant might be hard to find. When you enter Rue de la Tonnellerie it looks like a street you do not want to be on at night and you see no sight of a restaurant. It is there and you see it when you are in front of the entrance. The entrance is a bit weird though. Well inside you find the decoration very interesting, humorous and welcoming. It is actually an old cork-factory and they have kept the industrial atmosphere mixed with interesting modern artifacts. They also have an outside covered garden. Even if you do not have to you should visit the rest-rooms - it is worth seeing. The food is good, not fancy but the kind you come back for with friends and have a good time. The starter with different kinds of local "charcuteries" was very good and so was my grilled chicken that I had for main course. The service is nice and observant. My wife had been there a couple of times with a friend without me and was treated like a well known customer. We have tried to go to this restaurant a number of times but as we have not reserved we have had no success. On Mother’s day we however called in the morning and got a table for lunch. We were sitting in the very nice garden as the weather was warm and nice. We decided to have fish as main course, which was a very good choice. My wife had back of cod and I had one of my favorites - wing of ray - that was one of the best I ever have had. It was absolutely perfect in gravy on balsamic vinegar with lots of capers. My wife’s cod was also delicious. The restaurant have no set menus, but you can make a choice from anything on the menu, either two course starter-main or main-dessert or you can have a full three course meal of your choice. I think this is a very good idea. The only small objections were that we had to wait 30 minutes to order, which they apologized for and that my wife who is on a special diet was promised that they should make certain changes, something they forgot about. Still they had marked especially on the menu that they were happy to do such changes. This however did not change the fact that this was a lunch to remember in a very positive way. Leucate Village is a very picturesque village, where most buildings are very nicely renovated, which is not very common in the south of France. People down here do not really care about the outside of the buildings, but here they do. Maybe the reason is that there are a lot of people from the rest of Europe that own property and live here. Anyhow it is worth to take some time for a walk after the good meal. The restaurant is located just at the side of Canal du Midi in Homps. Homps has a number of restaurants, some just open in the summer but this place is open all year. 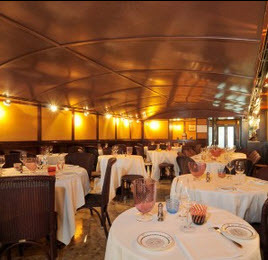 The place is unpretentious but the in-door dining room is very nicely renovated in modern style. The food is French, made with quite a lot of ambition, but still the prizes are affordable. The owners are English that makes it easy for those who still are a little nervous for ordering in French. Homps (pronounced “omps”, with a short “o” as in “off”) is one the many beautiful places along Canal du Midi. 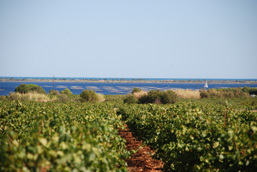 It is the home of the sparkling wine Chevalier de Malte, that Swedish readers might remember as the first drinkable and affordable sparkling wine that we could buy in Sweden. Trying to revisit in September 2013: The outside restaurant had more than 12 free seats and it was totally empty inside so we decided to eat here. We were ingnored when we came 15 minutes past 1 on a Thursday. Finally we stopped the owner and asked her if we could get something to eat. "20 minutes waiting", she snapped - no welcome, no smile, just a very stressed body-language and an angry face. "Waiting for what? ", we asked. "To order", she said, "we have many customers". We were not in a hurry so we could have sat down with a drink and talked for a while, but it was so obvious she did not want any more customers that day. We did not want to disturb her so we left for Restaurant La Péniche across the canal, where we were welcomed with a smile, despite a very busy restaurant. I do not think we will make her life more difficult by visiting her restaurant in the future. Revisited September 2014: Invited by English friends that assured us that the angry co-owner was not around any more we gave it a new chance. The food is quite good and the service friendly nowadays. If you are looking for a restaurant there you do not risk to meet any French people and everybody speak English, this is the place. 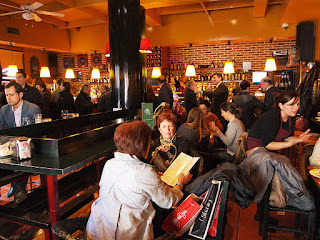 In Les Halles de Narbonne there are a number of small restaurants. The most famous of them is certainly Chez Bebelle. The owner is a rugby-star and that counts a lot in the south of France. Since French TV had a program about the restaurant it is almost impossible to get a seat there without a reservation. We went there with some American friends and we were twelve and a baby. This is the place to go if you want really good meat. Americans who are very spoiled when it comes to meat rate this place very high. 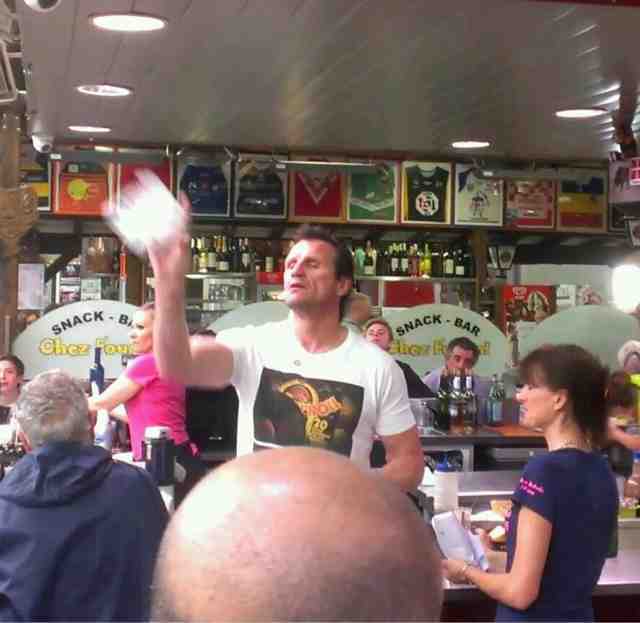 The really special thing might however be the “show” performed by the old rugby-star. When the waiters come with the orders he takes his megaphone and yell the orders to one or two of the butchers across the aisle. After a few seconds small packages of meat start flying through the air just over the head of the customers and he always catches them with perfect timing. Nothing less would be expected! There are restaurants everywhere in Carcassonne and it is hard to judge where to go. Some are good, some are acceptable, but a few are just there to attract tourists once. We visited the little restaurant Le Plô, which had got a large number of recommendations from the major guides and looked nice. It was a very nice experience. We were in a bit of hurry as our guests had to catch I plane in Toulouse and it was one of the very heavy days on French motor-ways. We just took one dish each and asked if they could serve us quickly. Even if the restaurant was packed the food came almost immediately. Two of us had sirloin which was perfectly cooked to our liking and very tender. It can, unlike in Sweden, be a problem sometimes to get tender meat in France if you do not order file or entrecote. I had a confit de canard that was one of the best I have had. It was stuffed with figs, very tender inside and crispy on the outside. The third person had a salad that did not had the same quality as the rest. 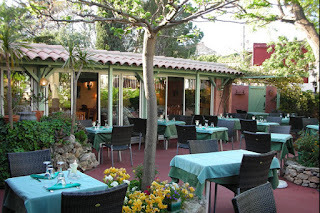 The restaurant has a small inside room and a large very nice covered outside space. Both places were almost full of guests when we were there. 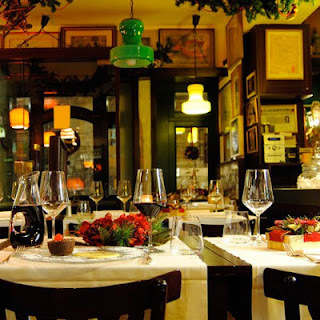 As it was New Years Eve we had booked a table at one of the best restaurants in Venice. 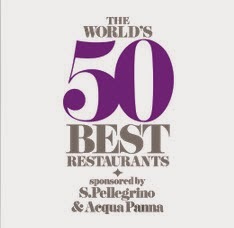 The restaurant is awarded one star in Guide Michelin. They only serve fish and sea-food and the food is excellent but ridiculously expensive - especially when we compare to our local three star restaurant that charge a fraction of the prizes here. They had a tasting menu for the prize of 230 euros per person and that was far above our budget, so we had a selection from the a la carte menu. I must say also that the design of the place was not at all up to what one can expect from a restaurant in this prize range. It is expensive to eat in Venice and it is full of tourist traps were you leave without feeling that you have got worth your money. We however found a very good restaurant that was packed with local people. We understood later that it was quite famous among local people. We got fantastic lamb-chops and turbot that was a dream. Perfect to a reasonable prize. 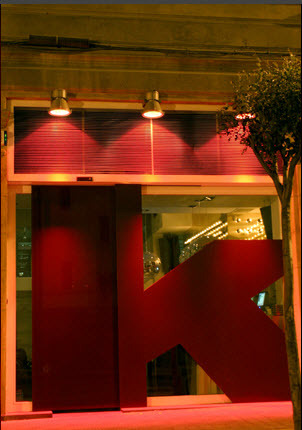 Kikara is a real super designed modern restaurant for the young and beautiful, but nobody minded us a little more matured being there. The design of the place is really something else and you get happy just sitting there. The food is excellent and best of all - it is not expensive. We had there standard menu with three fantastic starters, main course and dessert. It came with a very good bottle of Rioja and the prize was 29 euros per person. The only problem was that in the same room a group of their standard customer had fun and that was very noisy - almost unbearable sometimes. One of the great things in The Basque Countries is there version of tappas – pintxos. They are delicious small bits with ham, foie gras, fish, etc. on a piece of bread. In Bilbao we have found a place that serve the most fantastic ones. It is just a simple but very popular bar and is located in the center. The name is Bar El Globo. The central location, the very pleasant atmosphere and the fantastic pintxos makes this place a must when visiting Bilbao.